An Army Engineer has graduated from the University of Bath with a Masters degree with distinction in electrical power systems, having completed the final stages of his studies whilst deployed in Afghanistan. Captain Nick Nicholls, aged 43, is a Garrison Engineer (Electrical) with 528 Specialist Team Royal Engineers [STRE] (Power). He specialises in ensuring the military has the electrical power and infrastructure it requires to carry out its mission. 528 STRE (Power) are part of 170 (Infrastructure Support) Engineer Group which also comprises fuel, water development and works teams. The Group provides the specialist capabilities required to deliver infrastructure on operations abroad. Captain Nicholls decided to study for his Masters to gain a better understanding of how national power transmission and distribution systems worked. Historically, the Engineers have not normally dealt with national power transmission and distribution systems, instead concentrating on far lower voltage. The utility team was reroled in 2006 to form 528 STRE (Power). I decided to gain a qualification that would help me better understand how national power transmission and distribution systems worked. My dissertation looked at ways the power supply at Camp Bastion could be improved or operated differently to reduce the burden of maintaining and fuelling the system. The models I produced will help the MOD in reducing operating costs. It was a useful real world study and made good use of the skills I had learned in the course. Captain Nicholls joined the Army in 1986 as a Sapper, rising through the ranks to Warrant Officer Class 1, before becoming a commissioned officer in 2007. He gained a first class Bachelors degree with honours in electrical and electronic engineering in 2004. 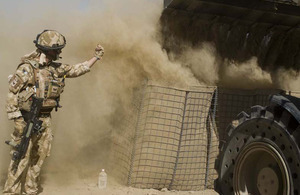 I led a team of eight engineers and technicians on a task to rebuild the power systems on 22 sites, concentrating on Helmand province, particularly the Sangin and Babaji areas. The operation was so successful that we developed a permanent team of eight soldiers who remain in Afghanistan and continue to work to rebuild and improve the safety and reliability of power on the forward sites. In the UK preparing for operations is the highest priority. This is not just about fitness and military skills but ensures you have the required knowledge and skills to face whatever challenges lie ahead - as a result time has to be set aside for study. I felt elation at having completed something so important, relief that it was all over, and sadness that I will be seeing less of Bath, its university and the staff of the electrical power systems course. My wife should be getting an honorary degree as well; she has been forced to learn alongside me, and has read and reread every word I have written and had to endure some very dull dinner conversation about the finer points of transmission system protection. I hope that something I have learned may help me and my team improve the lives of those soldiers who spend their tours on Afghanistan’s front line. In the pomp and circumstance of the day it is too easy to forget the sacrifices made by these soldiers every day.